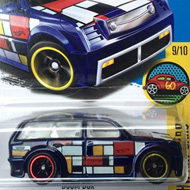 188/250 is part of the 2016 Super Treasure Hunt set and 3/5 in the BMW series. The car has Spectraflame blue paint with a hood and sides that feature a blue diagonal stripe, a red diagonal stripe, “44” in a white square, and “BMW Motorsport”. 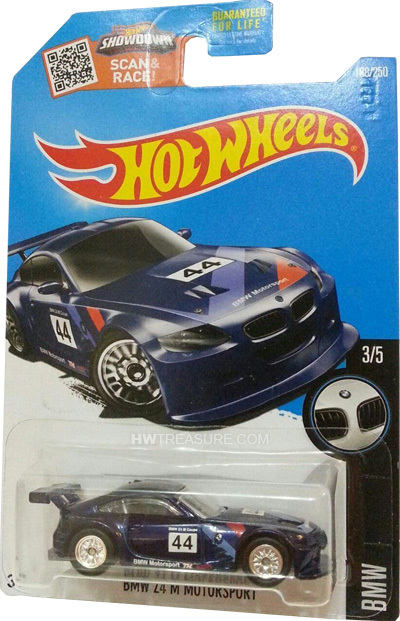 The sides also have “TH”, “BMW Z4 M Coupe”, and the Hot Wheels logo. 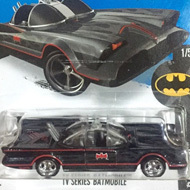 It has clear windows, a gray interior, Real Rider wheels, and a gray plastic Malaysia base. NOTE: Loose versions have appeared with red or unpainted bodies. This vehicle can be found in mix “K” of 2016 Hot Wheels mainline cases. The BMW made its debut in the 2012 New Models series. It is based upon a BMW Z4 M Coupe that has been modified for racing.